I'm already gardening, and even though nothing has come up out of the dirt yet, I'm getting excited. The idea of growing my own food just makes so much sense to me -- it feels like truly living, as opposed to paying (and relying on) somebody else to live for me. It's starting to look like something. That's right. It's a chicken coop! And I've got chickens! I picked up a couple of 10-month old gold-laced wyandottes from a local breeder, and after stopping by the feed store to get the necessities (feed, bedding, a watering can, a feeding can), I brought the chickens home. Aren't they cute? My cat seems to think so. It looks like at least one of them is productive. She set it in the bedding on the floor of the coop instead of in the nesting box. Oh well. It's still an egg. Hooray! 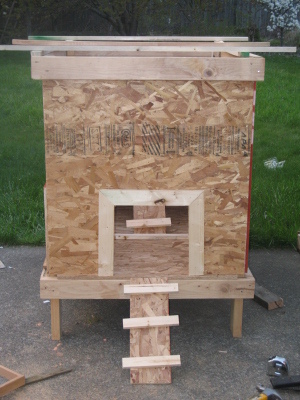 I still have a bit more work to do on the coop to secure it from the local raccoons and possums. They apparently have a habit of grabbing chickens and biting their heads off. Creepy. 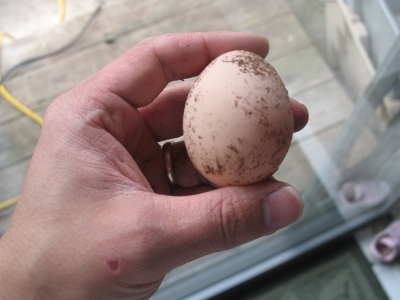 But yes - in addition to gardening, I now have a couple of egg-laying chickens. Woo hoo! nice! Let me buy some eggs from you! A wonderful coop! Looks like a cozy little home. The picture with your cat is precious! Ken - I'd love to sell you some eggs, but I've only got two chickens, and they only produce between 5-7 eggs per week, per chicken. Our family goes through that many eggs... so I'm not sure if we'd ever have extras to sell. Depending on how well we enjoy raising these two chickens, I may decide to get a few more chickens next year. 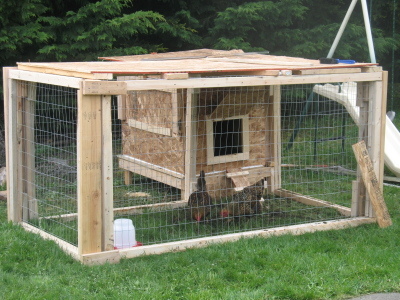 I'll have to build a larger coop and run... but maybe selling eggs would help me recoup the cost. Allison - thanks! 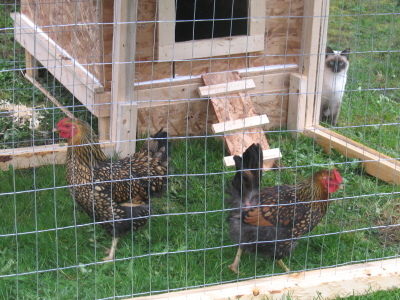 My cat wants to eat those chickens so badly. She has no claws, but she keeps reaching into the pen to try to grab them. Cracks me up. You need to clip your nails. Mark - your attention to detail is noted. You might want to plant some herbs. A rosemary bush adds content to your yard in the winter and provides fresh herbs all year long. I work next to Pontes in Seattle. They have a herb garden that blends into the landscaping next to their building and I see the chefs going out there all the time to clip some herbs. I've got some parsley and oregano in the dirt right now, but I'll probably grab some more. My priority is to get actual "food" to grow (I've got a mild survivalist streak in me); herbs and spices and the such are a secondary goal. But I would like to convert much of my back yard into something edible -- I think lawn grass is stupid. 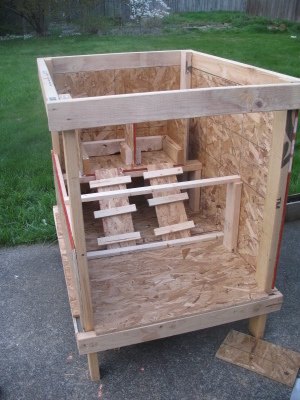 You do realize that particle board is not the right product to sheath the coop with. It is not meant to be used for outdoor and exposed area. It needs to have siding over it or vinyl flooring or shingles over it. Even if you paint it, it will rot and mold on you in a year or two. 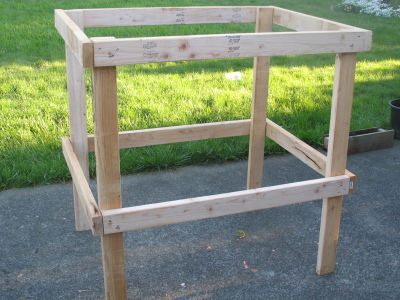 The 2x4's should have been pressure treated as well. You will know next time. Good luck. I hear fresh eggs taste much better then the ones bought in the store. Fresh chicken too! Also I heard that if there is no rooster then the egg production goes down. Will these hens continue to produce without a rooster. Caleb - the only problem with raising them from egg to chicken is that they cost a lot more. Chicks can't eat anything but feed, which means they'll go through a bag much more quickly than an adult will. You can give an adult chicken a pile of dirt, and it'll pick out the bugs, roots, and leaves of whatever is in that pile. That makes the feed last much longer. Also, egg production does *not* suffer without a rooster. They'll happily lay an egg every day with or without a rooster.